A fence is a great way to add personality to your yard, and it gives the added benefit of privacy. So, you’ve decided on installing a wooden fence. Congratulations! A fence is a great way to add personality to your yard, and it gives the added benefit of privacy. 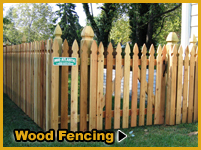 If you aren’t a picket fence person, that’s no issue; we offer many different styles and varieties. But we usually only use two types of wood, and we do so for very specific reasons. Read on to find out what your MAD fence is going to be made of. This wood is frequently used indoors and outdoors. It has a beautiful reddish brown color, which matches just about anything. And, we furnish it for you! But that’s not why we use it. Sure, it’s pretty–but some of the greatest features can’t be seen. For example, red cedar wood is flame resistant. If you’re building next to where you have your cookouts, then this wood is perfect! You can know you’re safe while grilling at all times. Red cedar has been used for centuries because it is incredibly durable. If you maintain it properly, the wood can last for decades. It also has the very convenient structural property that prevents it from warping, splitting or being otherwise damaged by elements that other woods would be. All of these reasons support why we use red cedar wood in our constructions! Pine is a wood that is known for its fresh scent. It’s used frequently in cabins because it keeps rooms light and airy, with a distinct wooden smell that makes you feel incredibly comfortable. We use yellow pine in our builds for several reasons; aesthetics, environmental impact, and quality. Pine is incredibly beautiful–it can be tarnished to a dark or light color, and is smooth and sleek. That’s one of the benefits of pressuring wood. But it also gives a positive environmental impact that saves wood. The ‘pressure treated’ part of its name means the wood is compressed so less wood is used. This also means the quality of the wood can easily be controlled; chemicals and treatments allow for the wood to be even more durable, but also odorless. There’s a natural scent of pine, but untreated, it is overpowering! Pine is a great choice for fences, which is why we use it. Interested in installing a new fence? MAD Fence is here to help.